Two organizations which support smart meters and smart grid implementation published highly critical reviews of the new documentary film, “Take Back Your Power,” even before it premiered on September 5th. The “TBYP” film itself is quite critical of the energy utility industry which has been replacing analog energy consumption meters with new so-called smart meters at an accelerating rate over the past few years. The new documentary film investigates the heated controversy surrounding the smart meters and such topics as utility overcharges, invasive monitoring, and adverse health effects. So as you can see, the EDF article attempts to inject doubt into any conclusions reached by the TBYP film due to the “personal experience” that may have shaped the film director’s views. A link will be provided at the end of this posting if you want to read the entire EDF article. For the most part it represents pro-smart grid propaganda, … although EDF does at least support the concept of consumers being able to opt-out of smart meters should they choose to do so. Another blog posting was written on August 16, 2013, by the Executive Director of the Smart Grid Consumer Collaborative (SGCC). The article starts out by describing the TBYP film as a “forthcoming documentary spreading misinformation about smart grid and smart meters.” Now how objective is that for someone to criticize a film on its content who no doubt had no opportunity to watch the new documentary in advance? The SGCC Executive Director then ends the blog posting by stating: “Too bad the Take Back Your Power crowd doesn’t realize their position actually gives away consumer empowerment to manage their electric bill and know details about their usage.” Again, these comments represent clear propaganda where the mandated smart meters are advertised as all about “empowering” the consumers, whether they want it or not. Now I don’t know exactly how many smart meters have been installed globally; I just know that there are too many. We do know there have been health complaints in probably every community they have been installed, and many complaints have been documented to be quite credible. This is where you get into tricky semantics. The SGCC Director refers to not having a “single verified instance of negative effects.” [The EDF article makes a similar claim.] What does the SGCC Director consider to be the approved method to verify “negative health effects” for each instance where it is reported? She evidently would not accept a medical doctor’s diagnosis. On the other hand, it is true that when a person dies from lung cancer, there is no absolute way to “verify” that a specific death was due to smoking cigarettes, radon exposure, or from some other cause. If one uses this type of logic, then there is likely no mechanism to “verify” reported adverse health effects to the satisfaction of the SGCC. How convenient. 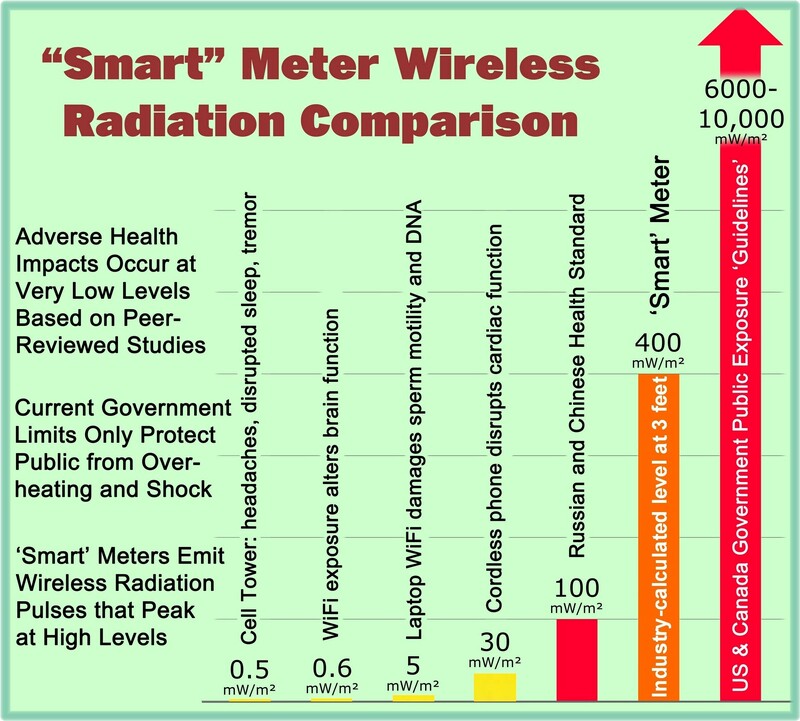 Then there is the ludicrous claim that “You would have to stand in front of a smart meter for 19 years to get the same radiation as you get from a 5 minute cell phone call.” These types of claims are frequently made by smart grid advocates without any accompanying basis information so that there is normally no way to test the validity of the assumptions. No doubt someone did calculate these values based upon some inappropriate assumptions in order to make the comparison sound as extreme as possible. However, based upon the information provided below, it will become clear that the SGCC claim does not pass the smell test. Both sides of the controversy can play games with these number comparisons between cell phones and smart meters. Such claims set up straw man arguments that are not helpful to settling any debate. The truth is that it is inappropriate to compare cell phone exposure values that are calculated for a device held in contact with the ear area to the more uniform whole body exposures received from smart meters. It is attempting to compare apples with oranges. In fact, in measurements conducted by Richard Tell Associates as a part of the above study, an RF detection device was placed at a height of five feet, such that it was located one (1) foot away from both a smart meter and a cell phone. The resulting spatially averaged RF field measurements were nearly identical for both devices. This is the sort of common sense starting point for making rational and real comparisons between smart meter RF exposures to cell phone exposures. Based upon the above information and other information that I have reviewed, if you talk on a cell phone in the hands-free mode, which is becoming very popular, your exposure is probably about the same as standing one to two feet away from a wireless smart meter. Beyond that, you can claim that being at a greater distance from a smart meter can be considered a differential factor under typical exposure scenarios as compared with a cell phone. Conversely, however, another differential factor is the chronic nature of smart meter exposure as opposed to most people using their cell phones for no more 20 minutes* per day for voice communications. There is also evidence that different signal characteristics of RF emissions from different devices may produce different biological effects. Once you add in the aspect of cell phone use being voluntary where smart meter installations are being mandated for everyone including children and vulnerable populations, you have a clear and compelling argument for questioning the wisdom of massive wireless smart meter roll-outs across many countries. The SGCC will no doubt never admit to adverse health hazards, privacy concerns, etc., regarding the massive roll-out of smart grid technology. The SGCC clearly represents the industry interests and is hopelessly biased. The Environmental Defense Fund, however, claims to have a mission “to preserve the natural systems on which all life depends.” With mounting evidence that RF emissions harm the environment**, maybe there is hope that someday the EDF will change its current position of supporting smart grid systems that implement wireless technology. Let’s also hope that the TBYP documentary film can help increase consumer awareness of the true costs and risks associated with smart grid systems. Certainly the film can be considered one-sided in its viewpoint, but it is “high time” that some large-scale “balance” is provided to at least offset some of the exaggerated benefits and propaganda disseminated by the utilities and the smart grid industry. This entry was posted in Smart Grid, Smart Meters, and RF Emissions and tagged Health Effects, Smart Meters, Take Back Your Power, TBYP. Bookmark the permalink. Doubting Thomas, if you watched Take Back Your Power you will know that besides the wireless radiation (involuntary) that these meters need to convert AC/DC so they include a device that creates what is known as dirty electricity, even more frequencies that add to health risks besides wireless pollution. A person who knows they have a problem with dirty power/RF may shut off a breaker in their home to take a break or turn off a computer or another appliance, which also uses these converters. BUT YOU CAN NEVER TURN OFF A transmitting utility meter or its power converter, which sends emissions onto home wiring 24/7. An important point in this debate is that I don’t care if you have equipment you decide is safe on your house. But you should not be able to force others to use equipment they find seriously risky, in order to get utility service. It is that simple. Free market choices are not possible with utility monopolies. Going off grid is too expensive and complicated for most people. Non-transmitting, mechanical analog meters should be allowed by all utility monopolies. We had these for decades with no problems and they work. FREE MARKET choice in a FREE COUNTRY is what we are talking about. I am convinced of your sincerity, but not impressed with your pseudo-scientific ideology. Isn’t it great that we can disagree in America? I hold my ground that utility monopolies should not be allowed to force dubious devices upon customers in order for them to get service. Thank goodness that you are free in America to decide to dismiss over 2000 U.S. military-compiled studies by Zory Glaser (sampled at Magda Havas site) from 1972, along with over 1800 studies from the recent five years and many studies in between showing biological effects from very low levels of EMF and specifically RF/MW. But that does not mean you ought to block other individuals’ freedom to reject these risky products – and still have utility service from these monopolies. I checked out the Richard Tell/Vermont report referenced above, and do not reach the same conclusion as you. Of course I may have missed something but I think you should review it. According to my understanding, the report states that it found an average MPE of 0.070% for a single cellphone. For multiple smart meters, the average MPE ranged from 0.0014% to 0.00058% – 50 to 120 times lower than the cellphone! Fast reply there Joe! My smart meter figure was from the top of page 89, and I did not notice that it refered to indoor readings. So, you were quite correct with your numbers. But, per the commentary near the bottom of page 90, the [local] SAR for the cellphone would typically be much higher than for a smart meter due to the closer proximity of the device to the head. More research would be needed to establish just how much higher it would be. OK, well now you are getting away from the point of my article, “that it is inappropriate to compare cell phone exposure values that are calculated for a device held in contact with the ear area to the more uniform whole body exposures received from smart meters.” That leads into the rest of my article where it talks about increasingly popular hands-free use of a cell phone, chronic exposure to smart meter, involuntary exposure to smart meter, and the fact that people only use cell phones on average about 20 minutes daily. What was being compared in the Vermont report was power flux density at a distance of one foot from the source for both devices. The question of relative RF exposure is independent of the purpose of the device under test. Even if one is a personal use exposure and the other is an environmental exposure, as in the cellphone/smart meter comparison. It’s not only appropriate, it’s the only practical way to do it. I’m all for using hands-free kits. With the above information as background, it is appropriate to make apples and apples comparisons between domestic sources of radiation emissions possibly present in and around the home. The Tell study provided a convenient and credible mechanism to compare cell phone and smart meter power density levels in a way that was based upon the same spatial configuration. In addition, it helps dispel misleading statements made by many smart grid proponents such as “RF signals used by smart meters are much weaker than the RF signals from cell phones.” … and of course the ludicrous and absurd statement made by the SGCC that: “You would have to stand in front of a smart meter for 19 years to get the same radiation as you get from a 5 minute cell phone call,” which prompted much of the main content for this website posting. To summarize, based upon testing performed by one of the smart grid industry’s most respected testing companies, one can say that testing showed that: “You can stand in front of a smart meter and get the same amount of radiation as you get from a cell phone call, minute for minute, during the call.” Why would the SGCC not make this claim based upon actual testing, at least as one example?